Attorney Matthew Fried | Mark E. Fried, P.A. 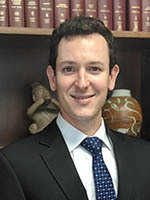 Matthew Fried was born and raised in Miami and is a third generation attorney. He completed his undergraduate studies at the University of Florida where he graduated with a bachelor’s degree in finance in 2008. Matthew then attended American University’s Washington College of Law, graduating in 2011. While in law school, Matthew participated in the trial advocacy program for both criminal and civil cases, as well as the Criminal Justice Clinic. As a student attorney in the Criminal Justice Clinic, Matthew practiced with the Montgomery County, MD State Attorney’s Office aiding in the prosecution of misdemeanor and traffic cases. After being admitted to the Florida Bar, Matthew began his legal career in the practice of criminal defense. He gained valuable experience working as a volunteer attorney for the Miami Public Defender’s Office. Matthew was an Assistant Public Defender in Collier County from 2013 to 2015, where he handled hundreds of cases ranging from second degree misdemeanors to first degree felonies. Here Matthew gained invaluable experience as lead counsel in felony jury trials and violation of probation hearings, garnering up hundreds of hours of courtroom experience.